Use two timer relays, first make a half-hour timer, 18000X0.1=1800 seconds, this timer will trigger an M point again, use this M point to trigger another half-hour timer again. This entry was posted in plc program and tagged gx developer off delay timer, PLC ladder, PLC ladder diagram, PLC Ladder Logic on December 12, 2018 by arco. To look many PLC Ladder Diagram is better for learn plc programming. you can learn the plc programming Thoughts and ideas. here is siemens s7200 plc rpgramming examples. Motors M1, M2, M3 three drive belt conveyor.Press the start button SB1, start the order of M1, M2, M3, the interval of 3s.Press the stop button SB2, the order of the parking for M3, M2, M1, the interval of time is 3s. Three motors M1, M2, M3 respectively through the contactor KM1, KM2, KM3 connected three-phase AC power supply, with PLC control of the coil of the contactor. This entry was posted in plc program and tagged Learn PLC programming, PLC ladder diagram, PLC Ladder Logic, PLC programming on July 27, 2016 by arco. Electric start belt,At the beginning of the belt has two push button switches: S1 for START and S2 for STOP;At the end of the belt also has two buttons switches: the S3 for START and STOP for the S4. You can start or stop the belt from either end. In addition, when an object on the belt reaches the end, the sensor S5 make belt stop. 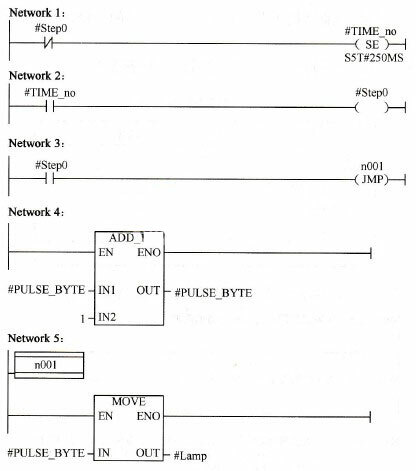 This entry was posted in plc program and tagged Learn PLC programming, PLC ladder diagram, PLC Ladder Logic, PLC programming on July 26, 2016 by arco. Siemens plc S7-300 programming the timer can also be a pulse generator. When the input I0.0 is 1, the output Q0.0 is 0 or 1 alternately, a periodic pulse signal for 3s, the pulse width is 1s. This entry was posted in plc program and tagged Learn PLC programming, PLC ladder diagram, PLC Ladder Logic, PLC programming on July 24, 2016 by arco. Today we’ll make a plc ladder diagram for siemens plc s7-300 control the motor start up. 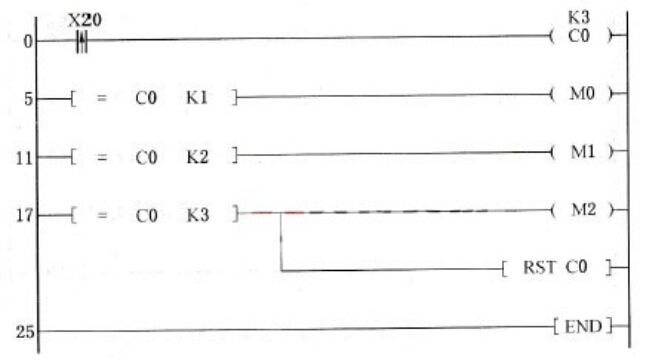 plc ladder diagram is very important to learn plc programming. There are three motors M1, M2, M3, press the start button to start M1, M2 starts after delay 5s, M3 starts again after 16s. This entry was posted in plc program and tagged Learn PLC programming, PLC ladder, PLC ladder diagram, PLC Ladder Logic on July 22, 2016 by arco. the operator can set the heating time with a dial switch, and the operator set the value to be displayed in a second unit in a BCD format. This entry was posted in plc program and tagged Learn PLC programming, PLC ladder diagram, PLC Ladder Logic on July 19, 2016 by arco. 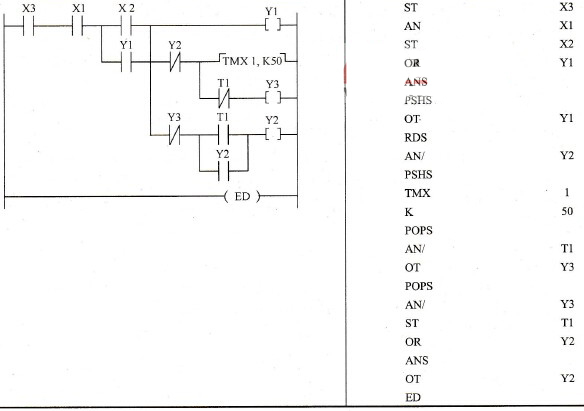 Now we learn plc programming examples for siemens s7-300 plc,here some ladder diagram program. Ladder diagram is the most used graphic programming language, it is called the first programming language of PLC. Ladder diagram and electrical control system circuit diagram is very similar, with intuitive and easy to understand the advantages, it is easy to be mastered by the factory electrical personnel, especially suitable for switching logic control. Ladder diagram is often referred to as the circuit or program, the design of ladder diagram is called programming. 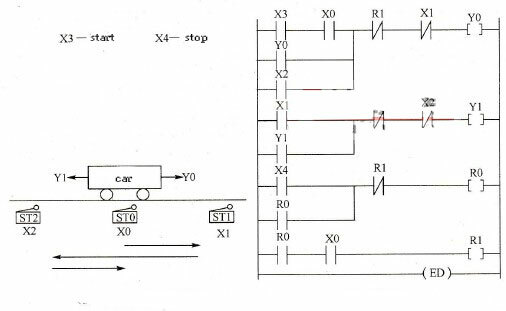 Some of PLC ladder diagram programming element follows the name of the relay, such as input relay,output relay, internal auxiliary relay, etc., they are not real physical relays, that are some storage unit (soft relay), a storage unit for each soft relay and PLC memory image register. The storage unit if the “1” state, the ladder diagram of the corresponding soft relay coil energized, the normally open contact is turned on, normally closed contact is disconnected, this is the soft relay “1” or “on” state. If the memory cell is “0”, the state of the coil and contact of the corresponding soft relay is in contrast to the above, this is soft relay is “0” or “OFF”. The use of these “soft relay” is often called to as the programming element. 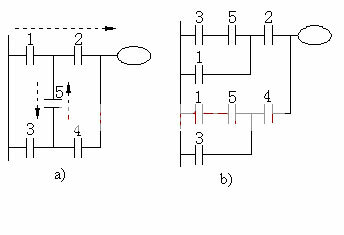 Figure, contacts 1 and 2 is switched on, there is a supposed “concept of current“ or “Power Flow), flowing from left to right, the direction and execution when a user program is consistent with the order of the logical operations. Power flow can only flow from left to right. Using the concept of energy flow, can help us to better understand and analyze the ladder diagram. Ladder on both sides of the vertical line is called public (Bus bar) ,. 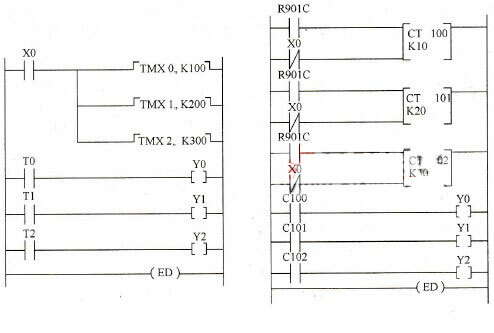 In the analysis of ladder logic, in order to borrow the relay circuit analysis method, there are conceivable between the left and right side bus (left bus bar and right bus bar) a left and right positive negative DC supply voltage, the “power flow between bus bar “from left to right. You can not draw right bus bar. 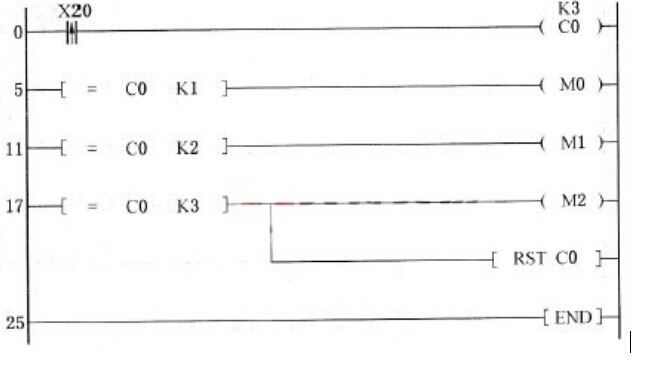 According to the state and the logic relation of each contact in the ladder diagram, the state of the programming elements corresponding to each coil in the diagram is obtained,is called logical solution of ladder diagram. 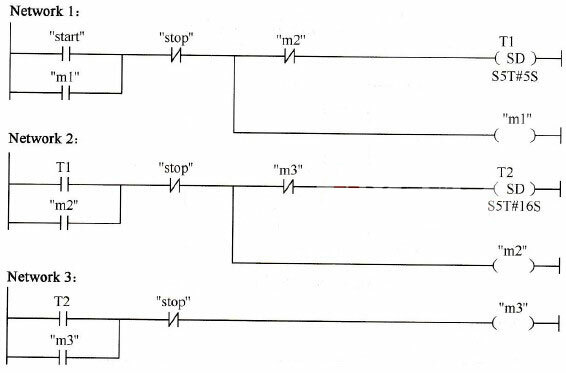 Ladder logic solutions were considered by from left to right, top to bottom sequence. The results of the resolver, can be immediately utilized by the logic solver behind. – Logic be based on the input image register values, rather than resolver the instantaneous state of the external input contacts carried out. This entry was posted in plc program and tagged Learn PLC programming, PLC ladder diagram, PLC Ladder Logic on July 18, 2016 by arco. there is example Shuttle program. The initial state of the car parked in the middle (limit switch X0 is pressed, the normally open contact closure),Press the Start button (X3 closed), the car began to follow the direction shown to reciprocate when you need to stop, press the stop button (X4 closed), stop automatically when the car moves to the middle position. Here all the buttons and travel switches are normally open contacts are connected to the input terminals of the relay. 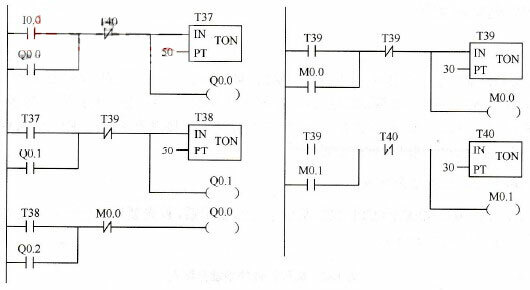 This entry was posted in plc program and tagged PLC ladder, PLC ladder diagram, PLC Ladder Logic on July 11, 2016 by arco. plc programming often using timers and counters for Sequence delay control. After X0 is turned ON,begin delay, after 10s Y0 turn on, after delay 20s Y1 turn on, after 30s Y2 turn ON. When plc programming often need several hours, or even longer delay, the best way is series timer, or PLC internal counter.Using the timer series Can be a long delay, in essence, it is to allow multiple timers turn ON, delay time is Accumulating multiple timer settings. Set time of the timer T1 is a counter C100 input pulse signal, so that the delay time is several times of T1 setpoint. The internal special relay R901E (1 min clock) as the counter C100 input signal, so that the time delay is a few minutes. If a counter does not meet the requirements, the counter can be used in series, that is, the contact of the front counter is used as the input pulse signal of the back of a counter to achieve a longer time delay. when your learn plc programming , you must need plc system start up. PLC system start up include Start self-locking, without self-locking. but how you choose the ladder diagram? This entry was posted in plc program and tagged PLC ladder diagram, PLC Ladder Logic on July 10, 2016 by arco. Press the start button SB2, contactor KM1 coil get electricity and self lock, KM3 coil power, which normally open the main contact closure, motor access power supply, and Y connection to start running. At the same time, the time relay KT coil power, after the delay, the normally closed contact is disconnected, cut off the power supply of the KM3 coil, making the KM3 power loss, normally open contact off, normally closed contact closure. 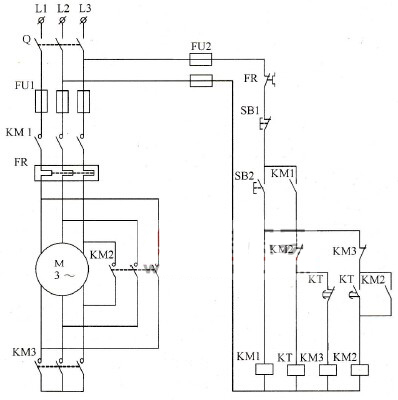 KT of the normally open contact is closed and a contactor km2 coil power, km2 main contact closure makes motor by Y connection switching method for delta connection operation. 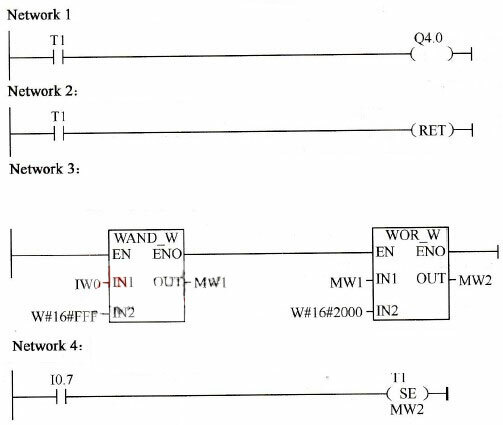 This entry was posted in plc program and tagged PLC ladder diagram, PLC Ladder Logic, PLC programming on July 8, 2016 by arco. the rising edge of the X20 is used to trigger the output of the M0 coil, and the output of the M0 normally open contact is used to lock the output. When any one of IR00004 and IR00005 is “ON”, HR0000 will be set to “OFF”. This entry was posted in plc program and tagged PLC Ladder Logic, PLC programming on July 3, 2016 by arco. No function code set and reset. From the handheld programmer to enter them as FUN and SET key or FUN and RSET button, followed by the address. ② rise differential differential and the falling edge. Rise differential and the falling edge of the so-called differential refers to the input signal front porch and back operations. Rise differential differential command is used to enable and falling in a cycle time of the built-in “ON”. In implementing the conditions “OFF” to “ON”, the rising differential instruction makes a cycle of operation “ON”, in the implementation of conditions “ON” to “OFF”, the falling differential instruction makes a cycle of operation “ON”. Both of these instructions requires only one line mnemonics. Here, in IR00000 to “ON”, IR20001 in a cycle will reset “ON”. Then perform DIFU (13) 20001, no matter how IR00000, IR20001 will be “OFF”. Falling edge differential instruction IR00001 to “OFF” after (IR20002 “OFF” until this time), the IR20002 will be built in a cycle “ON”, and will be implemented in the next DIFD (14) 20002 post “OFF”. ③ maintain. Use directives to keep based on two perform conditional operations. Doing so will keep the instructions attached to two on the command line. When the first command line execution at the end of the condition for “ON”, keep instructions operating position “ON”. When the end of the second command line execution as “ON”, keep instructions operating position “OFF”. Even if it is located in the internal interlocking parts of the program, keeping the operation of the directive will save it to the “ON” or “OFF” State. In the example shown in Figure 1-33, when IR00002 is “ON” and IR00003 to “OFF”, the HR0000 will be set “ON”. HR0000 remain “ON” until another IR00004 or IR00005 reset “ON”. Keep instructions as the others, need more than one command line, the command line in the instruction encoding before they control.